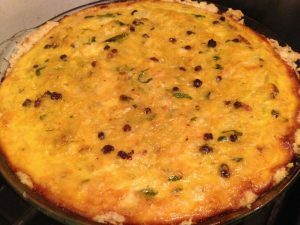 This sweet onion quiche comes from 14th C. England. Tart in ymbre day. Take and perboile oynouns & erbis & presse out þe water & hewe hem smale. Take grene chese & bray it in a morter, and temper it vp with ayren. Do þerto butter, safroun & salt, & raisouns corauns, & a litel sugar with powdour douce, & bake it in a trap, & serue it forth. Filling: 2 medium onions, 1 cup raisins (I used ½ cup currants and ½ cup golden raisins), 1 cup mild cheese (I used ¾ cup toma piemontese and ¼ cup provolone), 5 eggs, 1 Tbsp sugar, minced herbs (I used parsley, tarragon, basil), 1 tsp sweet spices (I used cinnamon, ginger, and nutmeg), 1 Tbsp butter, ½ gram saffron. Allow ground saffron to bloom in a small dish of melted butter. Quarter onions and cook in a covered pan with a half inch of water until softened. Drain onions and chop them with herbs. Grate the cheeses, beat the eggs, and combine with other filling ingredients. Crust: 1 ½ cups flour, ¼ lb butter, ½ tsp sugar, pinch salt, 3/8 cup water (plus an optional ½ tsp vinegar). Combine flour, salt and sugar. Use a pastry cutter or food processor to cut in the butter until it is reduced to pea-sized lumps. Add the water and stir until a dough forms, but do not over-kneed it. Press into a flattened ball and cover snugly in plastic wrap. Refrigerate for at least 15 minutes. Roll out the crust using a floured surface and rolling pin, then transfer to a pie plate. Add the fillings and bake at 350° until set, around 45 minutes.